The analogue instrument piano and its eighty-eight keys or pitches form the framework of the joint programme. The instrument is measured, recorded and deconstructed acoustically and optically: all the strings of the piano are excited, recorded, digitally stored and later transformed in various ways. 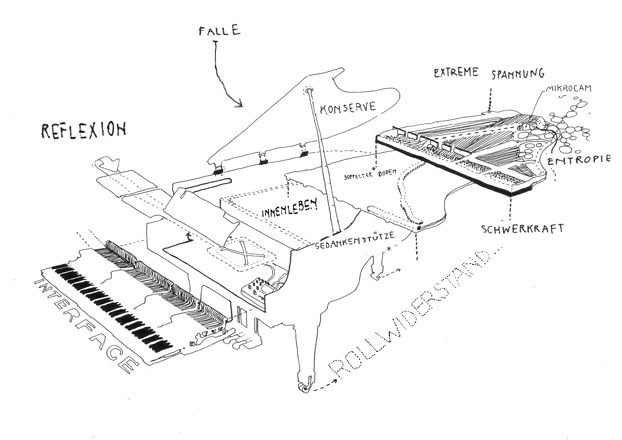 Parallel to this acoustic process, the piano's sound-box (wooden body, steel frame, strings, keyboard, etc.) is measured by means of hand drawings and micro-camera recording and transferred onto the level of the image. In this way the piano becomes a sound and image generator, on the one hand an electronic sound reservoir in the form of samples and a potential optical projection reservoir in the form of drawings and recordings, on the other. This results in an interaction and reciprocal influence between the levels of image and sound. 88 / track 3 from Josef Novotny on Vimeo.